Those Unfortunates are a four piece band based in London who release on the Midnight Bell record label. 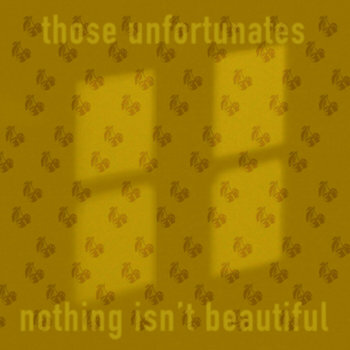 Nothing Isn’t Beautiful, their debut album, is a chronological collection of thirteen songs, written between January and November 2015 and arranged and recorded live by the band over two weekends in December of that year. Previous singles, A Question for Mr Richardson and A Repertory Man take up similar themes. The former is a Kinksy shuffle towards death by middle management; the latter (sung by Seb Brennan), a tale of the real world creeping in, told over multi-instrumentalist Magnus Alanko’s accordion. Nothing Isn’t Beautiful was arranged and recorded live in a borrowed Norfolk cottage over two weekends in the winter of 2015-6. The band worked with producer/engineer, Thomas Hatfield (The Good Gods, Wall Sun Sun, Stats), who beautifully captures every creak of the room, along with the sound of a band finding a new way of playing together. The album will be launched with a gig on Friday 19th May at Betsey Trotwood in Clerkenwell, London, preceded by a live session on Resonance FM on Saturday 13th May, on the deXter Bentley Hello Goodbye Show. The band will also be touring Germany in June 2017. Recorded and produced by Thomas Hatfield in Litcham, Norfolk over the weekends of 28th-29th November 2015 and 30th-31st January 2016. Those Unfortunates are: Magnus Alanko, Henry Bird, Seb Brennan and Ben Brill.